Low income families and seniors in Fort Saskatchewan will soon have access to new safe, modern and affordable housing. The Alberta government announced its $6M investment into the affordable housing project on Friday, February 8. A four-storey apartment building will be constructed and will likely include 83 one and two bedroom units. The City of Fort Saskatchewan donated the parcel of land adjacent to the new Dr. Turner Lodge for the apartments. “Our government is helping ensure Fort Saskatchewan residents do not have to leave the community they love to find housing they can afford. When this project is complete, people living in the community will have more options for a safe and affordable place to call home,” said seniors and housing minister Lori Sigurdson. The project is in the design stage and will aim for energy efficiency and include a few accessible units along with modern fire-suppression and safety systems. “On behalf of the City of Fort Saskatchewan, I thank the Government of Alberta for their investment in our community and support of affordable housing for our residents,” said City of Fort Saskatchewan mayor, Gale Katchur. Heartland Housing Foundation executive director, Nancy Simmonds said there is a long standing need for affordable housing within this sub-region, especially Fort Saskatchewan. She noted that the funding from the government and the land donation from the city are important first steps toward meeting that need. The provinces $6M contribution is part of their $1.2B commitment in the Provincial Affordable Housing Strategy. Their goal is to build and restore 4,100 affordable housing units. 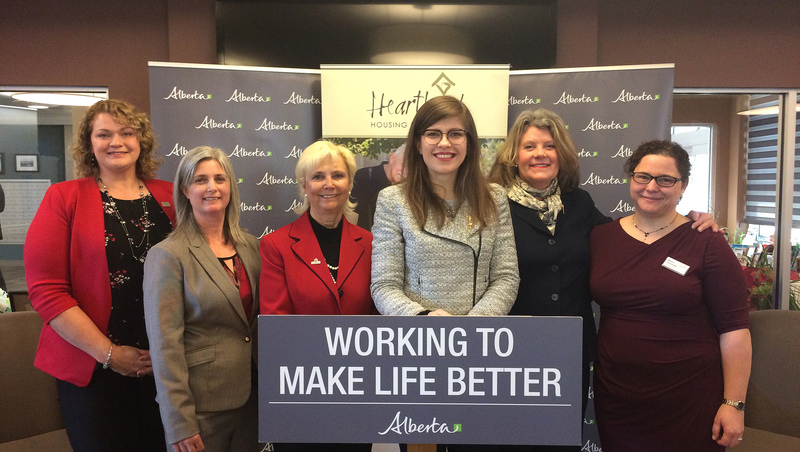 Photo supplied: Seniors and housing minister Lori Sigurdson, Fort Saskatchewan-Vegreville MLA Jessica Littlewood and Fort Saskatchewan mayor Gale Katchur along with Heartland Housing Foundation during the project announcement.